Neat and Tangled | A bit of this. A bit of that. Back again with a couple more cards inspired by the Fall | Winter Coffee Lovers Blog Hop. Maybe a month or so ago, I pulled all my coffee, tea and cocoa stamps from my various stamp bins and put them all together. I’m so thankful for this challenge as it’s given me a reason to use those stamps, which I was kinda surprised to see how many I had amassed over time. I really wanted to make a chalkboard inspired card so I pulled out the Warm Wishes stamp from Neat & Tangled. I heat embossed it with white embossing powder on a panel die-cut from white cardstock. And then, the magic happened. I slowly applied black ink to the panel with a sponge. It is amazing. The more ink you add, the more chalky it looks. But the white background helps keep it feeling chalkboard’ish. Once I covered the panel with ink, I buffed the embossed image with a paper towel and spritz on some diluted white paint (with a spray bottle). I wanted more of a rustic feel for this card so I used a bunch of paper scraps with a more vintage feel. I liked the card so much that I made a second one. This time, I went with a blue color scheme. One thing I did a little different was add a few drops of Glossy Accents to the Warm Wishes panel and dump some glass glitter on to them. Alright! That is it for me today. Don’t forget to check out the hop if you haven’t already. So many awesome projects have been uploaded so far. Great job, guys! The hop runs through the 7th. Back again with another stamped card to share with you. Today’s card is a birthday one! I hope you like it. I stamped the cute little donut people with Neat and Tangled’s Say Yes to Donuts stamp set. You can’t go wrong with donuts… in my world. Anyway, I had them sitting on my desk for some time, waiting and waiting (and waiting) for me color them in when I had some free time. I finally took the plunge and did it, coloring them in with markers. And then I got all “cray cray” put a ton of Glossy Accents from Ranger Ink on the frosting and sprinkled on a generous amount of sugar… errr… glitter. I let the donuts dry for, get this, probably 24 hours because (1) it looked so cool and (2) hello, all the Glossy Accents I put on them. Yeah. It was probably too much. But the results? So. Stinking. Cool. The patterned paper on the card? It’s from the backside of an older print from Doodlebug. Timeless print though. And the hearts? 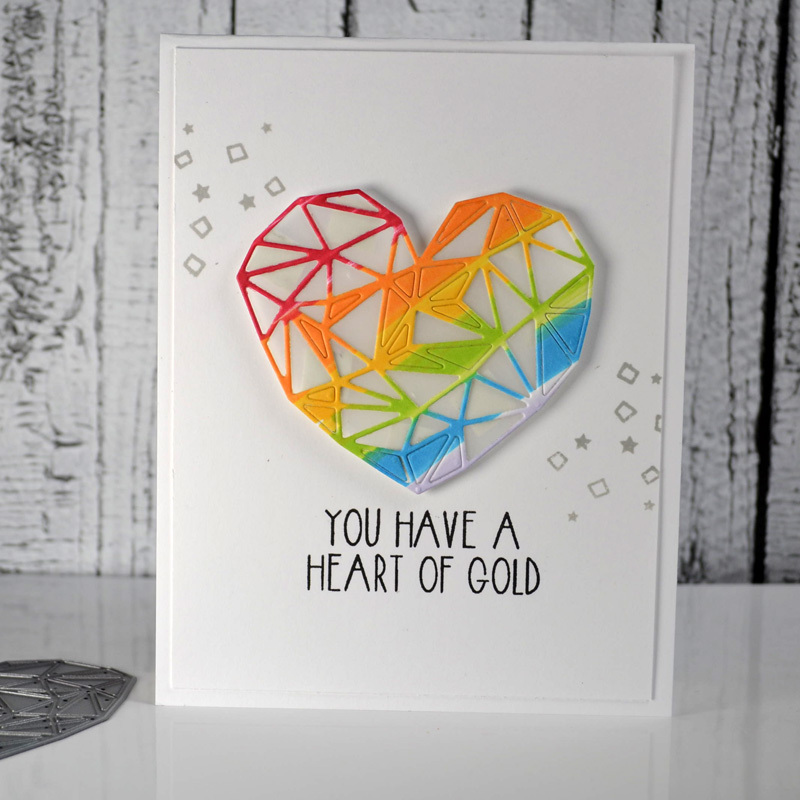 I can’t quite recall what die I cut them with, but there are lots of heart dies out there that are quite similar and would help you achieve the same look on a card of your own. Not much more to say today so that is it for now, my card loving friends. I’ll be back again later. Thank you as always for taking the time to stop by. It’s a real treat when you do. See you again soon. I sure hope at least. Super happy today to be joining a whole bunch of others paper crafters in sharing their top projects for 2017. Here’s a peek a my top cards shared here on the old blog-a-roo. They seem like a pretty happy bunch of cards! By the way, I’ve got a giveaway! Be sure to comment by 9 p.m. EST on Jan. 5th, 2018. I’ll pick one of you to score this set of snowflake dies from My Favorite Things. Alright! That’s all I have got! Super thrilled to be joining some of my most favorite’st folks in celebrating Neat and Tangled’s 5th birthday with a blog hop this week! In honor of the 5th birthday of Neat and Tangled, Danielle has put together a week long blog hop with different hoppers each day. Also, Neat and Tangledare also having a release of the special products used during the hop. They are available now in the Neat and Tangled shop. I’m super thrilled to share three projects with you today! Up first is this fancy number! Ta-da! Created this guy with the new Hooray Word dies, Hooray stamp set and Like Magic sequin mix. Pretty straight forward to figure what’s going on with this one! Wink! And here’s card No. 2 and card No. 3. Both of these cards use the new Hooray Word dies and Like Magic sequin mix. I created the starry background for both cards (as well as that first one) with one of my favorite N&T dies from the past, the Seeing Stars die. 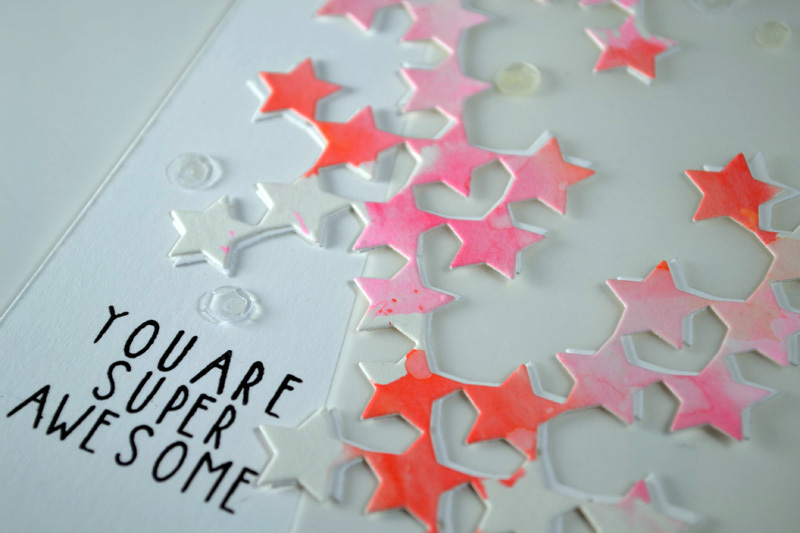 I simply cut the stars from white cardstock, adhered them to the card front and then sponged on some ink! Oh yeah! And those additional stamped words on cards No. 2 and No. 3? You might be wondering about that! They are from the Wild Ones stamp set! Alright, kids! That is what I have you! Next stop on the hop is the blog of the awesome Lisa Spangler. I can’t wait to see Lisa’s lovely work! Take it away, Lisa! There are prizes up for grabs – one $100 gift certificate to the Neat and Tangled shop and two $50 gift certificate to the Neat and Tangled shop. Winners will be chosen from comments left all along the hop all week long. Happy hopping, friends! Thanks, as always, for stopping by! Always a treat! I’m back again with another take on this year’s Christmas Card Challenge with my pal, Ashley. This is card for today. I wanted to be clean and graphic today so I whipped out the Very Merry stamp set from Neat and Tangled. It’s got some great words to pair together. I played it simple by going with a basic Christmas greeting. To give the card just a little bit of glitz, I added some glitter gold washi tape and a couple gold sequins. So easy but totally effective in getting the card done. So that’s what I have for you today. Be sure to stop by Ashley’s blog to see her take on challenge today. I’m sure it won’t disappoint. See you again soon, friends. Pretty dang excited to be joining my friends from Neat and Tangled for their 4th Birthday Blog Hop. They’ve put together a really fun surprise release in honor of the occasion, and I’m tickled to share a couple projects made with some of the fun new products. Yippee! Alright, let’s get on with the projects. Give it up for card #1. Had fun playing with a couple of the new products for this one. I especially dig that big panel you see. I cut it with the new Doily Tag die. I cut it three times – from wood paper and pink and dark pink cardstocks. And then I layered them all together. The celebrate word and mat was cut with the new Celebrate dies, while the stars were cut with the new Lucky Stars dies. If you look close, you’ll see the celebrate word has two tones of pink. I sponged a little ink on the bottom of the word before adhering it to the mat. You’ll also see some white stars in the open spaces of the doily tag. I just felt… well… adventurous. Thought it this one turned out pretty fun. I used the same supplies to make this one as the other. Those stamped words? Yep. They were stamped with a new product too. (Surprise, surprise… right?! Ha!) That would be the Celebrate stamp set. It’s a good one for making stuff for all kinds of happy occasions. Alright! That’s what I have for you. Be sure to check out all of today’s blog hop stops. And be sure to comment as you go! That’s because there are some awesome Neat and Tangled prizes up for grabs. There will be one $100 gift certificate to the Neat and Tangled shop and two $50 gift certificates to the Neat and Tangled shop. Winners will be chosen from comments all along the hop all week long. Woohoo! Thanks for stopping by today, guys! You are the best. Happy Birthday, Neat and Tangled! I’m excited to be taking part today in a blog hop in honor of the 3rd birthday of Neat and Tangled! In honor of Neat and Tangled’s birthday, there’s been a special blog hop happening all week long! Oh yeah, and there’s a special surprise release too! 2 new stamp sets, 2 new dies and some new sequins! Woohoo! So I have a couple cards to share with you today. First up is this jazzy little number. I just plain love the new Seeing Stars die. It is so cool! I applied watercolors to watercolor paper. I let it dry and then I die-cut the stars out of it. I really wanted them to stand out on my card so I die-cut them a second time from plain white cardstock and layered those watercolor stars on top. By the way, that phrase is from the new Happiest Birthday stamp set. So I just wanted to play and try something new for me here. 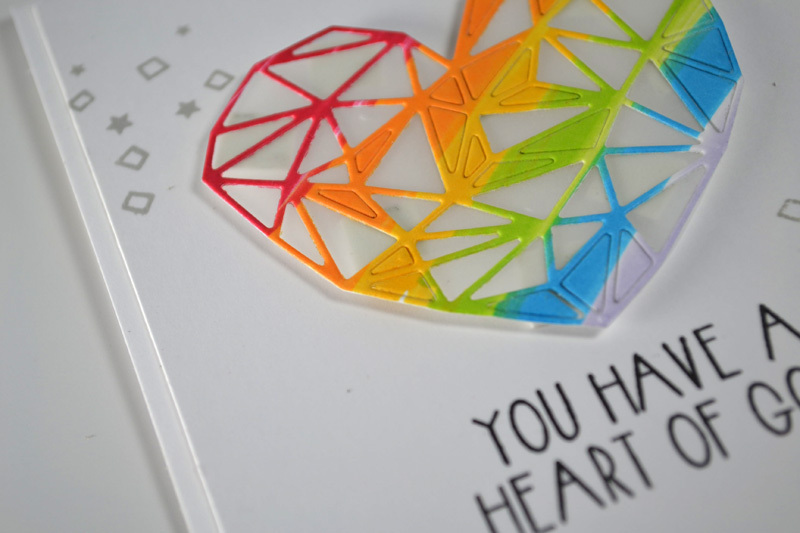 I scribbled a rainbow’s worth of markers on cardstock and then I die-cut the Heart of Gold heart out of it. I purposely left some of the inner pieces in. I dunno. I think it just added to the card. I wanted the heart to pop somewhat so I adhered it to vellum, fussy cut it and then placed it onto my card. If you look really, really, really, really close, you’ll see foam tape under that heart. But the vellum hides it pretty good! By the way, the words on this card are from the new Heart of Gold stamp set. Alright, so that’s what I have for you. Be sure to stop by all the stops on today’s segment of the hop. Thanks for stopping by today, guys! I always appreciate your comments and kind words.